It started the day before on my wife's birthday, October, 11.2014. We had plans all day so I didn't plan on hunting one bit. After a morning full of running around and a hearty lunch, my wife decided she wanted to take a nap, so I took the opportunity to go pull the cards from my cams. I was anxious to see what was moving since I had made a mock scrape and set the cam up on it in video mode. I grabbed the cards and headed back home. I put the card in the reader and was surprised to see that five different bucks had hit the mock scrape, and one of them was buck #2 on my hit list. I immediately checked the weather forecast to see where the wind was going to be in the morning. Perfect, ESE wind at a gentle five miles per hour. I knew it would be one of the best days to sit after seeing him move through the area the day before. I made plans with a friend who was coming out to the farm to hunt and told him when to get here, and where to sit. I told him I would be up at 4:45 am and he should be at the farm no later than 5:15 because we needed to be in stand by 5:30-5:45 am. Mainly because if you get there later you risk bumping deer. Night came and I headed to bed around 10:30 pm, anxious for the next morning. The next morning comes along and my alarm never went off...and I woke in a stooper at 6:01 am. I literally sat up in bed, yelled a profanity, and ran out to the garage to get dressed. I put my base layers on, threw on my harness, strapped on my release, put on my boots, threw my camo in my back pack and strapped it on, grabbed my bow, and ran down the road. I couldn't take my normal route into stand since it was so late in the morning. I ran the whole way thinking, "Oh my gosh, what have I done." I got to my stand, put on my camo, sprayed myself profusely with scent killer (nearly an entire bottle) and climbed up. Oddly I wasn't sweating, which was good. I looked at my phone and it was 6:27 am. My buddy sent me a text at 5:15 am asking me where I was and if I was hunting. I replied back over an hour later and told him what had happened, he laughed. Around 7 am my heart finally quit beating at a supersonic pace and I was able to relax. I sat there motionless watching and listening when I heard something. I checked the time, it was 7:07 am. I started scanning slowly from left to right when I finally caught what was making the noise. I could see the outline of the body and could tell it was a big deer about seventy yards away. I stood up and grabbed my bow. As it got closer I could start to see the antlers. I knew it was a buck... but which one? He was walking very slowly, taking a few steps, stopping, looking around, and then taking a few more steps. When he got to fifty yards I put the range finder on him and knew he was one of my hit list bucks. He was headed right at me, so I waited patiently. 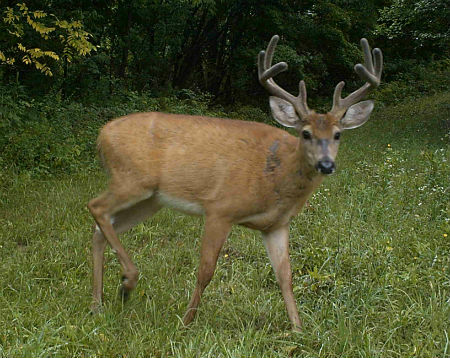 Brandon's buck before the 2014 season in velvet. He got to twenty-five yards and his head went behind a tree so I drew. He stopped, looked around and took two steps heading away from me. This put his vitals behind a limb so I held on him. I thought to myself, "Two more steps and you're smoked." He took one more step and stopped... still no clean shot. Finally, he took the last step and stopped again. I had my thirty yard pin on him, found my mark, and squeezed the release trigger. The X1 Pro arrow tipped with a Rage II blade and a Lumenok took flight and found its mark. He took off running and stopped about forty yards away and started to slowly walk. I watched him go out of sight. I could see the Lumenok lit up as the arrow was stuck in the ground. I waited thirty minutes and got down to check the arrow. It was covered with a mixture of guts, dark red blood, hair and brighter red blood. He was quartering away hard so the arrow entered back a little and came out behind the front shoulder. I texted my buddy and told him I just smoked one of the hit list bucks and I was heading back to the house. Although I had really good blood at the spot, I wanted to give him a few hours since it looked like I hit him back a little. My buddy met me at the house after his hunt was finished and we discussed a plan. We gave the deer three hours total and then headed out. We got on the blood trail and followed it for about 300 yards before finding him piled up under a big tree. I was ecstatic, he is my biggest buck to date with my bow. 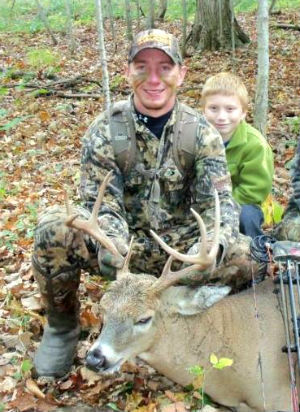 He is a typical 8-point that weighed 175 lbs. and an estimated age of 3 years old. I have pictures of this buck from last year and he really put on some bone. It pays to let the one and two year old's walk. 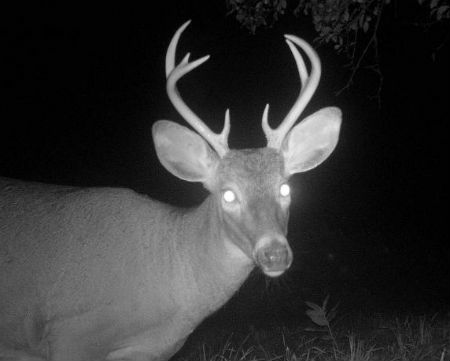 Brandon's buck caught on trail cam in 2013.